The advanced fiber technology of these extraordinary cloths penetrates and removes dirt, soap scum, water marks, grease and bacteria with just plain water. There's absolutely no use of any harmful bathroom cleaners and their noxious fumes. The Sponge Cloth is for thick grease and dirt. Its superior water absorption and superabundant holding capacity makes it an ideal bathroom cleaning tool. The Glass & Polishing Cloth is for glass, light cleaning and final polishing. (Not for use on electronic screens and delicate lenses). 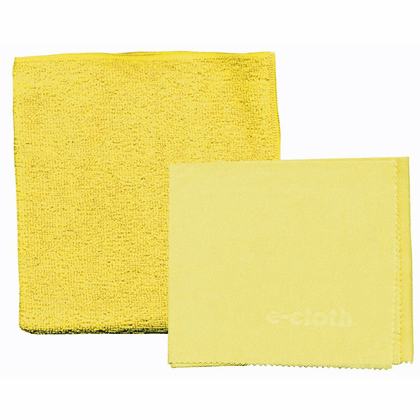 e-cloths really are different and give a fantastic chemical free clean with just water. If you take care of them they will last for years. e-cloths work so well that you will get a lint-free, smear-free clean with just water.